BECCA & TEL AVIV & ME/NEIL in NYC, and….HOST A HOT MARCHING BAND! writing to you from an in-between space in brisbane, australia. i’m having the usual difficulty keeping up the pace of reportage on my own existence, which seems to get more beautiful and surreal by the moment. i’ve delivered 3 house parties in the last three days and my heart is exploding with love and stories…but i don’t have time to put it all into words…it’s like…. i dunno. here’s the thing, before i get to announcing some new shows and all that. there’s been such an insane influx of IMAGES and MOMENTS floating through my life, many being captured on camera, that i feel like i’m drowning in a sea of digital representation….it’s actually plugging up the drain. i’ve tried to attack this problem from a million different angles over the years, and it seems like an unsolvable problem. the more i do, the less i blog. does anyone else have this problem? it’s a very particular kind of modern constipation. i’ve heard there’s a new modern epidemic, often to be found in major metropolises or huge music festivals, called FOMO (Fear Of Missing Out). i don’t feel like i’m missing out. but i do feel a crazy imbalance when amazing things happen and i don’t tell you. am i sick? there seems to be one possible solution: hire my own personal manic-depressive photo-journalist sidekick to accompany as i enact out this bizarre existence. my brain cannot do these two things at once. so? outsource. and if it goes well, maybe we can start a franchise. your own personal hunter s thompson. “AMANDA, WE ARE PARTNERS IN THE CRIME OF CAPTURING THE ILLUSION OF THIS FATED RELATIONSHIP BETWEEN YOU AND THESE SOON-TO-BE CORPSES”. preferably – bien sur – he’d wear sunglasses at all times. i’m going to try to paint with words. that is what i have time to do right now, as there’s soundcheck in 45 minutes and this is my time off today. i have to learn to write anyfuckingway. the book is coming together in my head, and i’ve been digesting everything that you guys have been throwing my way. i feel it coming together, some placenta forming, dots connecting. i want to write the next installment of the book-blog (pt.1 here/pt.2 here), but i’ve been waiting until a moment where i actually have the energy to read the comments as they come back at me in realtime. so stay tuned. the house parties have been too epic and i feel need their own well-edited e-book, and i feel too badly blogging the australian house parties while i’m still behind and haven’t blogged the last batch of north american shindigs. am i sounding like a broken record? i feel like one. one nice band-aid is that the tumblr feed has been a haven for my overscheduled-self colliding with my over-sharing self: lots of people have been writing their own accounts of the house parties and i’ve been reblogging them. tumblr has become a nice, homey, place to be. it’s funny: all these platforms (twitter, tumblr, instagram) truly have their own character. twitter is the crowded pub downstairs from your apartment. tumblr is the bookshop cafe across the street. instagram is the used clothing store that sells illicit cherry-flavored vodka from behind the counter. but i’m keeping up with certain friends and people’s lives through all these platforms….it’s amazing. i randomly decided to follow damian from OKGO on instagram…and i only follow a handful of people. i now know everywhere he’s been in the last year. i know more about his life than i do about most of my friends back home. he takes amazing photos, damian. he’s all symmetrical. back to the point: i’ll blog the house parties not in real time, but in slo-mo. if you’ve BEEN at any of them, help a brother out and send good photos to me & hayley at photos@amandapalmer.net. that’s where we put the booty and sort through it. then usually sean picks the winners and hits them over to my desk, and i blog when i have time. meanwhile, here are some announcements of upcoming shiznit, and a call for help…. i am going to make my first trip to israel, with neil, to play two shows…one house party that was purchased on kickstarter (one of the last of 35, they’re winding up and have all been incredible) and one official show in tel aviv at club barby (more info below). when i first found out that i was going to need to travel to tel aviv for the house party, i asked neil if he wanted to go with me. he’s been there and has his own connection with the joint; given his family’s jewish heritage, some of his family wound up there after the holocaust. i considered doing a regular show and put the word out on twitter, looking for advice. i was already aware of the cultural boycott (you should be too, read up here…my good friend and activist shawn setaro – erstwhile bassist with the dresden dolls – had been keeping me updated for a while and was the first one to make me aware of the boycott back in the day). when i got a few tweets back from people who thought it would be a mistake, i decided to think about it more, dig deeper. i didn’t book anything and i went off on european/UK tour #1 in july and august. i ran into edward ka-spel, my hero from the legendary pink dots, who’s about to tour in israel, and i got the whole low-down on what it’s like to play there from him. i kept thinking. they reached out to see if we would look into what they were doing, and offered to show us around to see for ourselves what was happening. so we’re going to get together with them when we visit israel, to see the areas they’re talking about. but mostly i just want to play music. if you want to discuss this with me and with everyone else, please do in the blog comments. please be kind to each other. if you missed the memo on twitter and tumblr, neil and i are planning to finally publicly release the live record we kickstarter’ed oh-so-long-ago. we’re going to make new (less over-the-top, but still real nice) packaging for the three discs and also finally make some vinyl. we’ll have info on the actual pre-order for the album itself SOON SOON SOON but meanwhile we’ve decided to book a little record release action in NYC. we’ll play stuff from the album and probably do some new things and mostly just throw down on stage in our usual improvy way, and hopefully invite some special NYC-area guests to come hang. there are JUST A FEW tickets left for the show in NYC, HERE. there’s a rumor that a second night will be added, but it’s not confirmed. stay tuned. we’re also going to be together for a VERY special show in boston, with a lot of our friends. at the beautiful Somerville Theater. as most of you know, we lost our friend becca last year for reasons unknown. i wrote a long blog about her HERE). she was a big part of our lives and the dresden dolls’ community. her parents reached out to me and neil to see if we would help signal boost the scholarship fund they’re trying to start over at smith college, becca’s alma mater. they need to raise a lot of money in a small amount of time to get it legitimately rolling. we decided it would be a good idea to get all becca’s boston-area posse together to throw an event in her honor. the night will be presented by me, brian viglione (of the dresden dolls and the violent femmes :), mr neil gaiman, and tons of art/filmmaker/performer friends of becca’s, including michael pope, cormac bride, emilyn brodsky, siena oristaglio, and cassandra long…the list goes on. the whole night will be a celebration of becca’s life and the art and music she loved. we will play songs, show clips, share stories, and remember her together. if you didn’t know her, you should still come. you’ll get to know her. and she was awesome. you’d have wanted to know her. seats are $25, with a limited number of Gold Circle seats for $100. 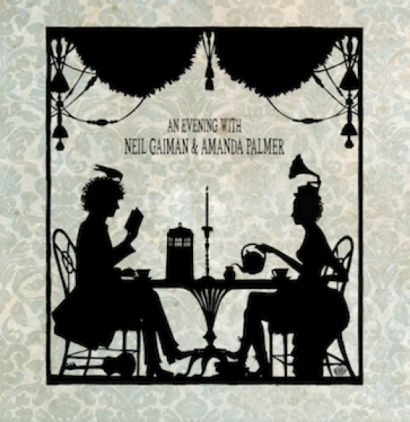 Gold Circle seats include an after-show meet and greet, plus cassandra long’s original, limited edition art poster (still in the making) signed by the performers. tickets are available HERE. btw, the venue holds about 900. please buy in advance. 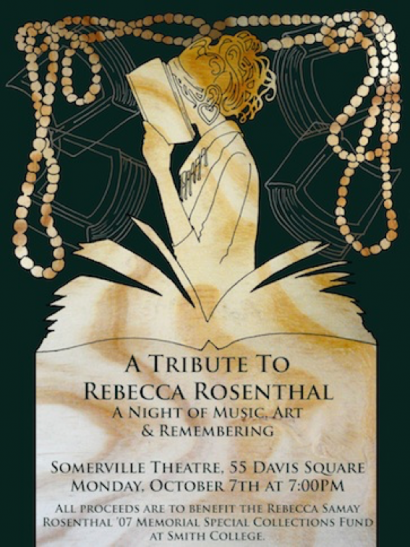 ALL proceeds are to benefit The Rebecca Samay Rosenthal ‘07 Memorial Fellowship Fund at Smith College. LASTLY…the VERY LAST LEG OF TOUR for THEATRE IS EVIL is going to be in europe. the shows for HAMBURG, COPENHAGEN, COLOGNE, BRUSSELS, BERLIN, WARSAW, KRAKOW, MILAN, BUDAPEST, MUNICH, and VIENNA are all on sale here, some shows are nearing sold out, BUY AHEAD!!!!!!!!!!! but they need your help if they’re going to make it very far outside the UK. if you saw these guys in london, you can understand why we want to encourage them my any means possible to come and play with us….they’re incredible and crazy and loud and smart and wonderful (and pretty good-looking). if you CAN help them out, DO!!! 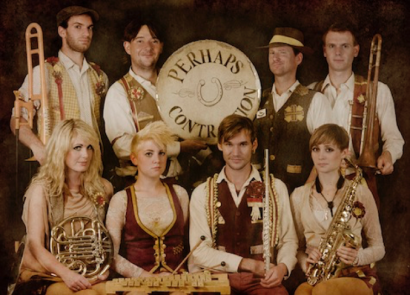 Perhaps Contraption are a 9 piece art pop marching band thing from London seeking extra shows (living rooms, warehouses, clubs, bathrooms, parks, ANYTHING) and places to rest their weary heads during a jaunt around Germany and Belgium with AFP. They can provide sweet sweet morning song and/or evening party oompah in exchange for attentive audiences and shelter! Oct 29th: A place to stay in Hamburg after the AFP show. Nov 1st: A place to crash in Cologne after the AFP show. Nov 2nd: A place to crash in Brussels after the AFP show. Nov 4th: A place to crash in Berlin after the AFP show. Nov 5th: Head home to London with big smiles aplenty. if you can help them in any way, email christo! and that’s all for the moment. if you want to follow the day to day magic, before it goes into the blog-processor, follow the twitter. and if you happen to know my hunter s. thompson, hit me in the comments. in memory of becca darling becca darling has left us. (a remembrance.) how to tour in a band or whatever pictures of the new band, and i warn you, they are hot.